There is the well-known Prophetic Hadith, ‘Go seek knowledge even as far as China’. Today, China has a Muslim population of over 23 million. This is divided into two main groups – the Turkic speaking Uyghurs in north-western China, and the Hui people. The Hui number over 10 million people, and live mainly in the central and northern provinces – there are over 200,000 in Beijing, for example. The Hui are known as ‘Chinese Muslims’ – an ethnic rather than a religious minority – and unlike the Uyghurs which have their own distinct language and culture, have adopted the local dialect and customs of where they live. Despite this, the Hui people have maintained a strong group identity, part of which involves tracing their lineage to a ‘foreign’ ancestor. The Hui tell many stories to explain where they came from, but the most popular involve the Companions of the Prophet Muhammad (pbuh). The origins of the Hui people have been the subject of popular legends since the Ming dynasty (1368-1643). These legends have been crucial to the formation of the Hui as a distinct Sinophone Muslim community. In a Chinese cultural environment, the presence of "foreign" religious communities provokes questions such as "How did they get here?" and "Why did they stay?". The most popular of the Hui origin legends concern the Companions of the Prophet (members of the first Muslim community, in Arabic: Sahabah), who travelled from Arabia to China during the early years of Islam. A number of these legends begin with the Tang emperor Taizong's (r.627-650) dream-vision of the Prophet Muhammad, the literary use of a dream motif that also appears in legendary accounts of the origins of Buddhism in China. Other stories portray the Prophet Muhammad in a manner reminiscent of the portrayal in Chinese literature of Confucius. The Islamic legends typically describe the Companions of the Prophet as having been invited by the Chinese emperor, drawing a connection between the early Islamic community and the Chinese imperial cult, thereby helping to define a place for Islam and its prophetic teachings within orthodox Chinese cultural and political traditions. The Companions of the Prophet who, in Hui legends, overcame many hardships to bring the Arabic revelation to China, were not just minor figures from amongst the tens of thousands of Muslims that lived in the time of Muhammad. Sa'd ibn Waqqas, for example, who has a tomb built in his honour in Guangzhou, is best known for leading the Islamic conquest of Persia. 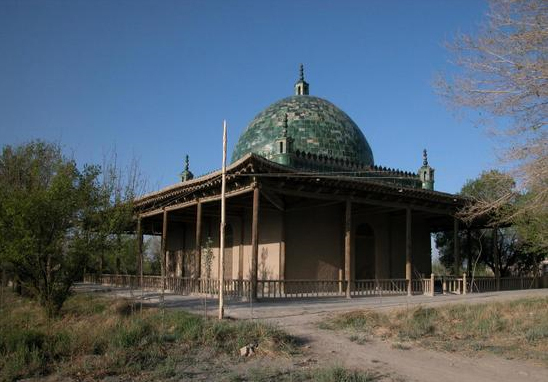 Thabit ibn Qays, who has a tomb in Hami, Xinjiang, was the first of the people of Yathrib (Medina) to swear allegiance to Muhammad after the flight of the nascent Muslim community from Mecca, and later became the orator of the Prophet. Both of these Companions were amongst the select group of ten whose place in heaven was foretold by the Prophet, a list that also includes Abu Bakr and the three other Rightful Caliphs. The Muslims of eastern China have been followers of Sunni Islam since the Ming dynasty. Legends of the Companions fall firmly within the Sunni tradition, whose followers believe in the blessedness of the community of Muslims that lived during the lifetime of Muhammad, in contrast to followers of the Shi'i tradition who revere the family and descendents of the Prophet. As well as explaining how Islam was transmitted to China, the stories of the journeys of the Companions to China also help to define the relationship between Sinophone Muslims and the larger Islamic community. Tombs dedicated to four of the Companions of the Prophet are found in the coastal cities of Guangzhou, Yangzhou and Quanzhou, the three main trading ports of the Yuan empire. One story of how these Companions came to be buried on Chinese soil is related in a late-Ming dynasty gazetteer titled Min shu (Fujian Gazetteer, 1619). The compiler of this gazetteer, He Qiaoyuan, describes the genesis of a holy site dedicated to two Companions of the Prophet at the foot of Ling Shan ("Auspicious Mountain"), several miles to the south of Quanzhou. This story was based on an interview with a Muslim scholar resident at the Ashab Mosque in Quanzhou (Mosque of the Companions, in Chinese: Qingjing si), the walls and entrance of which can still be seen today. The main entrance of the Ashab Mosque, Quanzhou. The surviving walls were built in 1310. Two Companions of the Prophet are said to be buried at Ling Shan, a short distance to the east. In the Kingdom of Medina lived a prophet (shengren) by the name of Muhammad, who was born in the 1st year of the Kaihuang reign of the Sui dynasty. * On account of his divine qualities and beauty, the king employed him. Twenty years after assuming his royal post, a scripture was revealed that exhorted people to cherish good and abhor sin. He received a mandate from heaven to propagate this teaching. The hot sun would not burn him, nor would rain wet his clothes. He could enter fire without being burned, or water without drowning. Trees would come to him at his call. Over time, his law was implemented throughout the land. Amongst his disciples were four great sages [da sheng]. In the Wude reign of the Tang dynasty (618-626), they came to China to propagate the teaching. The first sage became established in Guangzhou, the second in Yangzhou, and the third and fourth taught in Quanzhou where they passed away and were buried. *That is, 590CE, while the conventional date for the birth of the Prophet is 570CE or fifty-two years before the flight of Muhammad from Mecca to Medina that is taken as year 1 of the Islamic calendar. The short biography of the Prophet Muhammad presented here is clearly influenced by the interpreted life of the Chinese sage Confucius. However, while Confucius roamed in search of a king willing to employ his talents, Muhammad took his instructions directly from God and did not serve worldly rulers. The word used here for the Prophet (sheng ren) is also the same as that used by the Song-dynasty lixue scholars for Confucius. Early Chinese-language accounts of Islam typically described the life of the Prophet through an implicit comparison to "Chinese" sages. This was for the simple reason that Islam was new to the Chinese written tradition, and no orthodox Chinese vocabulary had yet been developed to distinguish Islamic prophets from the inspired teachers of Confucianism, Buddhism and Daoism. Only in the late-17th century, with the emergence of a corpus of Chinese-language Islamic books and a systematic Chinese vocabulary of Islamic terms, did it become possible to write a Chinese biography of the Prophet Muhammad without constant reference to other Chinese religious traditions. In an earlier passage, the compiler of the gazetteer refers to Muslims by the standard term used from the end of the Yuan dynasty—Huihui—though his lack of familiarity with Islam is suggested by the careless manner in which he elides the Four Rightful Caliphs of the Sunni creed with the four less famous Companions who made their way to China. Perhaps because of this lack of familiarity, he appears to have taken his description of the message and miracles of the Prophet Muhammad directly from a Muslim informant. The expression "to cherish good and abhor sin" and the sequence of miracles performed by Muhammad involving hot sun and walking trees, can all be found in a famous poetic biography of the Prophet that became popular in China around the time that the Fujian Gazetteer was compiled. This is the Qasidah al-Burdah (Ode of the Cloak) by the Egyptian poet al-Busiri (d.1295), a poem that has been translated into Chinese many times and serves as a liturgical text in some Chinese Muslim communities today. The use here of nine four-character verse phrases in the middle of a prose text suggests that this passage may have been taken directly from an unknown Chinese translation of the Burdah provided by He Qiaoyuan's Muslim informant at the Ashab Mosque. A number of Ming-dynasty stele inscriptions, as well as oral traditions recorded in the twentieth century, give the name of the first of the four "sages" (Companions) as either Waqqas or Sa'd. Both names refer to Sa'd ibn Abi Waqqas. A tomb dedicated to Waqqas can be found in the courtyard of the Huaisheng Mosque in Guangzhou. The "light tower" at the Huaisheng Mosque, Guangzhou. The Companion Sa'd ibn Abi Waqqas is, in Ming dynasty legends, said to be buried here. The earliest stele at the Huaisheng Mosque, from the Ming dynasty, attributes the style of the tower to central Asia, and is similar to the 18th-century Imin Mazar in Turfan, eastern Xinjiang. 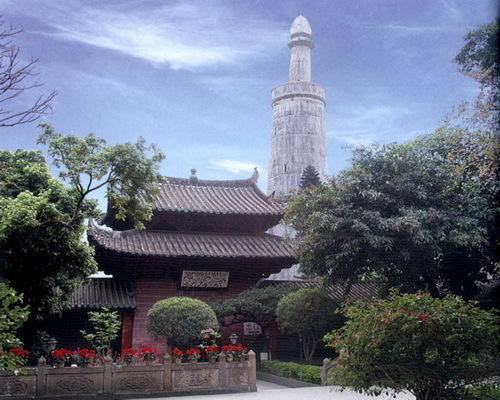 It is likely that the tower was originally built in memory of a shaykh from central Asia who came to Guangzhou in the Yuan dynasty. The master, who was granted the title Waqqas, hailed from Arabia, and was a maternal uncle of the Last Prophet. He was sent here on a mission to deliver the revealed scripture, and arrived in Chang'an in the 10th year (15 AH/637 CE) of the Zhenguan reign of the Tang dynasty. When the Tang emperor Taizong saw that the master was upright in his dealings with people, and demonstrated a great depth of learning, the emperor made repeated requests to retain him in the capital. And so the emperor had a Great Mosque built, and invited the emissary to live there with his attendants. The master explained the obscure passages in each book of the Quran, and exhorted the teachings of the Quran upon all the peoples of the land. The numbers of his followers and descendants steadily grew. The Taizong emperor later had mosques built for him in Jiangning and Guangzhou. Eventually, at the ripe old age of a hundred, the master embarked upon a ship and sailed west. [On the way home] he recalled that he had been sent out on a mission by the Prophet yet was returning without having accomplished it, and would be unable to rest at peace. So he turned around and set sail once more for the South China Sea... . [He] passed away at sea while still engaged in his mission. His transcendent body gave out the fragrance of Paradise. His tomb is outside the city wall of Guangzhou. In this story, the Prophet's disciple resembles not Confucius, but Xuanzang, the famous itinerant monk and translator who presented Buddhist scriptures from India to the Tang emperor Taizong. In this story, an added level of complexity is introduced when Waqqas passes away at sea "while still engaged in his mission". According to this account, it was a mission of the Prophet Muhammad, and dying whilst engaged in such a mission is qualification for martyrdom. In other versions of the Waqqas legend, he departs China on a mission from the Chinese emperor to obtain a complete set of the Islamic scriptures and returns with the six thousand verses of the Quran, much as Xuanzang had obtained the Buddhist scriptures for the same Tang emperor. The changed allegiance of Waqqas from Muhammad to Taizong in this alternative narrative is important, for by delivering a correct copy of the Quran to China, Waqqas was satisfying the desire for true learning of the Chinese sovereign rather than doing the bidding of a foreign prophet. Both these origin legends assume that Islam was brought to China by sea. An alternative set of legends emphasizes overland connections between China and the Islamic homeland. One of these is found in Huihui yuanlai (The Origins of the Huihui), which was the most widely read Chinese-language account of Muslim origins in the late-imperial period. A copy of this book was presented by the Qing Kangxi emperor to one of his Muslim generals in 1697, and it was written at some time in the previous century. The Qays tomb in Hami, Xinjiang. In the Huihui yuanlai account, the Tang emperor Taizong again welcomes the teachings of Islam brought to China by Companions of the Prophet. However, instead of Sa'd ibn Waqqas, this time the delegation is led by Thabit ibn Qays. A tomb in honour of Qays is found in Hami, on the north-western border of Ming China. In the evening of the 18th of the third month, in the second year of the Zhenguan reign of the Tang dynasty, the emperor dreamed that a turbaned man came running into the palace grounds, chasing after a demon. He woke up and was puzzled by the dream, for he knew not what it foretold. On the following day he assembled all the officials of the court to discuss the matter. The diviner of dreams reported, "The turbaned man is a Huihui from the Western Region, out beyond the Jiayu Pass. The kingdom of Arabia is ruled by a Muslim king of great knowledge and virtue. His land is rich and powerful. The demon entering the palace grounds surely means that there is evil lurking, which you will only be able to dispel with the help of a Huihui." The general reported, "The Huihui are impeccably honest in their dealings. If you meet with them peacefully, they will serve you loyally and with no care for reward. You may send an emissary to the Western Region to see the Muslim king, and request the services of an enlightened one (zhenren) to keep the portended evil at bay." The Emperor did as was advised, and sent the senior official Shi Mingtang on a mission to present a letter to the Muslim king. The Muslim king was delighted upon receiving the letter, and sent the senior disciples Qays, Uways and Husayn to China to offer their services. Husayn and Uways could not adapt to the new water and climate, and died en route. The sole survivor, Qays, crossed mountains and rivers, suffering great hardship, to eventually arrive in China. The Emperor received him with full honours, and asked what were the ritual and scriptural differences between his land and China. The turbaned man replied that the revealed scripture of the Western Region was called the Quran, which could be likened to the Five Classics of China. He then expounded the difference between Eastern and Western ritual and teachings. The Emperor was delighted, and so selected 3,000 Tang soldiers to move to the Western Region, in exchange for 3,000 Muslim soldiers to accompany the turbaned elder in China. These 3,000 Muslims had countless descendants, and are the ancestors of the followers of Islam in China today. Interestingly, the first two entries of the Song dynasty Buddhist text Gao seng zhuan (Biographies of Eminent Monks) include many of the same details as those that appear in this story: the emperor's dream, the narrative sequence of the dream, and the interpretations of the ministers that the dream spoke of a prophet from the Western Region. The Companions in this story come overland, rather than by sea as they did in the two previous stories. This overland connection with the Islamic homeland of Arabia is supported by the presence of a tomb dedicated to Qays in Hami, a city on the north-western border of the Ming empire. While some legends concerning Waqqas have him coming to China by sea (as the one recounted earlier), other versions of the Waqqas legend have him travelling by land. The route followed by the Companions in Hui legends depends partly on the geographic location of the Muslim community where the legends developed. Legends from east and south China give preference to the coastal route between China and Arabia, and those from Shaanxi and Gansu emphasize the overland route through central Asia. Sa'd Ibn Abi Waqqas is one of the most famous Companions of the Prophet. He was from the same tribe as the mother of the Prophet Muhammad, was one of the first to follow his teachings and, at the high point of his illustrious military career, led the Islamic conquest of the Persian Sassanid empire. The details of his life are found in the canonical Sunni collections of hadith (traditions of the Prophet Muhammad) and histories that were compiled in the third Islamic century. From these same texts we also learn that Waqqas retreated from public life after the conquest of Persia, and passed away in Medina at the age of eighty. Medina is a much more credible resting place for Waqqas than Guangzhou. Judging by historical sources, it is unlikely that Waqqas travelled much further east than Hamidan in western Iran. Nevertheless, Waqqas is a natural choice for Sunni legendary accounts of the transmission of Islam to China. He was one of the favourite Companions of the Prophet, and was best known for taking Islam into the eastern lands of Persia, an important step in the journey of Islam to China. The other Companions who embarked on missions to China are also unlikely to have made the journey. Like Waqqas, the historical details of their lives made them appropriate choices for characters in legendary accounts of the transmission of Islam to China, or candidates to be patron saints of the Muslim community in China. Thabit ibn Qays, like Sa'd ibn Waqqas, was one of the select group of Companions whose place in Paradise was foretold by the Prophet Muhammad. He was the first resident of Medina to declare his loyalty to the Prophet after the Prophet's flight from Mecca, and became the Prophet's orator. Qays led the Ansar ("Helpers")—the people of Medina who swore allegiance to Muhammad after the flight from Mecca—at the battle of Najd. There, he was martyred and was buried where he fell on the battlefield. A favourite Companion of the Prophet who helped introduce Islam to a new community in Medina and who had no established tomb site, the story of Qays could be readily attached to an old tomb site by the Muslim community of Hami. According to the story recounted above, the second Companion who accompanied Qays on his overland journey to China, is Uways al-Qarani, the famous Yemeni aesthete whose fragrance was carried by the southerly wind to the Prophet in Medina. There is no evidence of there being any tomb dedicated to Uways in China, but he is the reputed founder of a number of the popular Sufi organisations in central Asia and north-western China today. The third Companion is probably Husayn, the grandson of the Prophet, the second son of Ali and Muhammad's daughter Fatimah, and the third Imam of the Shi'i line. The presence of a revered figure of the Shi'i tradition in a Sunni origin legend may seem a little odd, but his appearance alongside Uways provides a link with the Sufi tradition of Central Asia. Most of the Sufi spiritual lineages, such as the Naqshbandiyya, that have been popular in Central Asia since the 16th century, follow Sunni creed but acknowledge two separate lines of transmission for their esoteric knowledge, one through Abu Bakr (the first of the Four Rightful Caliphs) and another through Ali (the last of the Four Rightful Caliphs). The Naqshbandiyya and other related Sufi organisations were pre-eminent amongst the Muslim communities of north-western China from the beginning of the Qing dynasty, when Huihui yuanlai was compiled. Within this tradition, Uways and Husayn were amongst the greatest of the martyred Companions of the Prophet, and their biographies are included in The Garden of the Martyrs (Rawzat al-Shuhada) by Husayn Kashifi (d.1505), a Persian collection of stories of the martyrdom of the Shi'i imams and other early martyrs of Islam that was popular amongst the Sunni communities of north-western China during the Qing dynasty. Most of the extant Hui origin legends regarding the transmission of Islam to China achieved their present form in the late-Ming or early-Qing dynasty. They can be dated by reference to steles in Chinese mosques and early Chinese Muslim printed texts that recount origin legends. Evidence of their age can also be inferred from the language of the earliest of these legends, which employ an orthodox Chinese vocabulary of Islamic terms that was not developed until the seventeenth century. However, legends are the material of oral literature, and the earliest written accounts represent only the endpoint of a long process of oral narrative development. In the Kaihuang reign [581-600] of the Sui, our Companion Sa'd Waqqas first brought the teaching to China. The date given here is similar to the date given in the Fujian Gazetteer for the first revelation of Muhammad but, unlike the gazetteer account, no claim is made that Waqqas was buried on Chinese soil. This is possible evidence that in eastern China during the late-Yuan dynasty, the legends concerning journeys to China by Companions of the Prophet were not associated with any tomb cults. 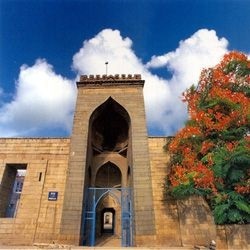 This was the first mosque of the people of this land. This auspicious mosque is named the Mosque of The Ancient and The Old, is called the Mosque of the Congregation and the Street, and is titled the Mosque of the Companions. It was built in the year 400 AH (Song dynasty; 1009CE). Three centuries later, Ahmad bin Muhammad Quds, the renowned Hajji, the "Foundation", of Shiraz, built this soaring dome, widened the entrance, redecorated the doors and renovated the windows, completing the works in the Hijra year 710 AH (Yuan dynasty; 1310CE). May the Almighty God be pleased by this act, and grant him mercy, and have mercy upon (the Prophet) Muhammad and his family. This inscription tells us that the name "Mosque of the Companions" dates back at least to the beginning of the 14th century, and possibly to the beginning of the 11th century. There is no mention of there being a tomb of one of the Companions in the vicinity. Further, it is plain from this inscription that the Muslims who renovated the mosque in 1310 believed that an Islamic community was not established in Quanzhou until several centuries after the time of the Companions. Moreover, despite the name of the mosque, no direct connection is made between any of the Companions and China. Its title is simply a reflection of the Sunni affiliation of its congregation, an affiliation that is borne out in the two less formal names for the mosque and in the place of origin of its renovator, Shiraz, which in the 13th century was a Sunni town. The Chinese name of the Yuan dynasty mosque in Guangzhou, huaisheng, can be understood as "devoted to the Prophet", or else "devoted to the sage" who is supposedly buried there. This is how the name is usually explained in texts from the Ming dynasty. However, the name may have originally been a direct translation of the Arabic word for "Companions of the Prophet" (huai "to cherish" for the Arabic "sahabah"). Muslims in Yuan dynasty China used Arabic and Persian as their written language. This mosque would have mainly been known by its Arabic name during the Yuan, and this may have been identical to that of the main Sunni mosque in Quanzhou, the "Ashab Mosque" or "Mosque of the Companions." 1. See Zhang Xinglang (ed. ), Zhong Xi jiaotong shiliao huibian (Historical documents on East-West relations), 4 vols, Beijing: Zhonghua Shuju, 2003 edition, p.749. 2. Lan Xu, Tianfang zheng xue (The true learning of Arabia), Beijing: Niujie Mosque, 1925 edition (first edition 1852), juan 7; quoted in Zhang Xinglang, op. cit., p.744. 3. Zhang Xinglang, op. cit., pp. 741-42. Zhonghua Shuju, 2003, p. 520. 5. Wu Wenliang, revised by Wu Youxiong, Quanzhou zongjiao shike (Religious inscriptions of Quanzhou), Beijing: Kexue Chubanshe, 2005, plate 7. Chen Dasheng, Quanzhou Yisilanjiao shike (Islamic inscriptions of Quanzhou), Yinchuan: Ningxia Renmin Chubanshe, 1984. Feng Jinyuan (ed. ), "Zhongguo Yisilanjiao beiwen xuanzhu" (A selection of Chinese Islamic stele inscriptions), in Bai Shouyi ed., Zhongguo Huihui minzu shi (A history of the Huihui Nationality in China), Beijing: Zhonghua Shuju, 2003, pp. 461-533. Lan Xu, Tianfang zheng xue (The true learning of Arabia), Beijing: Niujie Mosque, 1925 (1852). Ma Kuangyuan, Huizu wenhua lunji (Essays on Hui culture), Beijing: Zhongguo Wenlian Chuban Gongsi, 1998. Wu Wenliang, revised by Wu Youxiong, Quanzhou zongjiao shike (Religious inscriptions of Quanzhou), Beijing: Kexue Chubanshe, 2005. Zhang Xinglang ed., Zhong-Xi jiaotong shiliao huibian (Historical documents on East-West relations), 4 vols, Beijing: Zhonghua Shuju, 2003. My gratitude to Dr. Muhammad Deyghani of the Persian Languages and Literature Department of Tehran University for help in translating the Arabic transcription from the Ashab Mosque. Please type '301' into this field.